Normally this space is dedicated to information to help those of us in the sewing business with various sewing / alteration / crafting topics. However, today, we’re going to talk about helping YOU get organized for Holiday gift giving. For those of us who enjoy making gifts for family members, friends, children’s teachers, neighbors etc, now is the time to gt organized and figure out exactly what you want to make for each of them. Each gift must be personally chosen for the recipient, and be something they would actually USE, not just something to be tossed aside later. Begin your gift making process by writing a list of everybody you want to make a gift for and then list their hobby, what they do for enjoyment or something about their job that they’re very proud of. After completing my list, I always go to my favorite website, Patterns2Go.com and see what all is available there that might work for some of the people on my list. There is such a wide variety of patterns in all categories that I usually can find most of my patterns there. 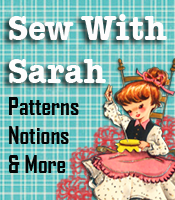 You can also head over to SewWithSarah.com to check out the downloadable patterns available. If there are some chubby girls on your list that you’d like to make a cute blouse for or other items, check out the Plus Size Girls patterns. The patterns have been made using REAL plus size children’s measurements, so you know the fit will be great for her. The plus size boys / girls patterns are actual patterns with easy directions to help you make the garments. After completing the gift list and items to make, it’s time to dig into the sewing room and see what fabrics and notions I have available in order to get started on some of the projects immediately. As I assemble the necessary items for each project, I put the fabric, notions and pattern into a zip lock bag with the name of the receiving person on the outside. (If the fabric and notions are too big for a zip lock bag I simply place them into a larger plastic grocery store bag, tie the top and put the name on the outside). The person’s name is then marked off my list. I then put the zip lock bags into a small box where they are ready to start working on as I have extra time. After assembling all I can from my sewing room, I take the remainder of the list to the fabric store to purchase the necessary items for the gifts. The newly purchased materials are then divided up for the individual gifts, and again I place the pattern and materials into a zip lock bag with the receiving person’s name on the outside. Within a day or two I have organized and assembled all the necessary items for each person’s gift, and am ready to sit down and start putting it all together. By starting early I have time to get all the gifts completed between my other sewing projects and ready for gift giving. Learn to sew faster, better and easier with this 500 Kwik & Easy Sewing Tips book. Many of these time savers are so simple, you’ll wonder why you never thought of them before. 500 Kwik & Easy Sewing Tips contains the best of customer hints and tips accumulated over 25 years. Spiral binding makes it easy to turn to each tip you need at the moment. This could be the best book in your sewing room! Don’t let another day go by without this valuable time saving and money saving book. You’ll have the corners turned down on nearly every page so you won’t forget the tips and hints on those pages – or have a book full of sticky tabs like Ms. Bloss does! 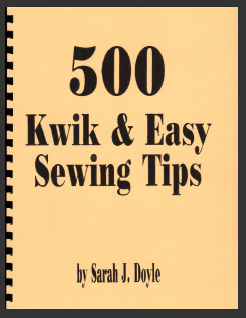 “500 Kwik & Easy Sewing Tips” is just $9.95 and is spiral bound so you can get to the tips easily. The gown is for a Christmas play. I used the nightshirt pattern, changed up the neckline so the opening would be in the back rather than in the front, and here it is! For a closure at the back neck I used a small square of velcro hook and loop fastening. By the way – the shorts and shirt aren’t ONLY for pajamas — the pattern can be made into awesome “basketball” shirt and shorts. There are many uses for this pattern, which comes in 2 different size ranges. You can get the S-M-L-XL pattern or 1X-2X-3X-4X size range. Patterns include all patterns pieces to make the various sizes mentioned and comes with easy instructions for making the items.